Balayeuse? What’s that, you ask? And why would I need it? Well, if you’re making a trained gown, particularly one from the Late Victorian period, you would definitely need it to keep your train from getting filthy after dragging along the ground! Balayeuse is a French word that literally means “street sweeper” – in costuming terminology, it refers to a layer of ruffles tacked onto the underside of a gown’s train, the idea being that dirt and grime will coat the ruffles and not the gown itself. After a particularly hard wearing, it would be removed and either thrown away and replaced with a new one (if you were wealthy) or cleaned and sewn back on (if you weren’t). 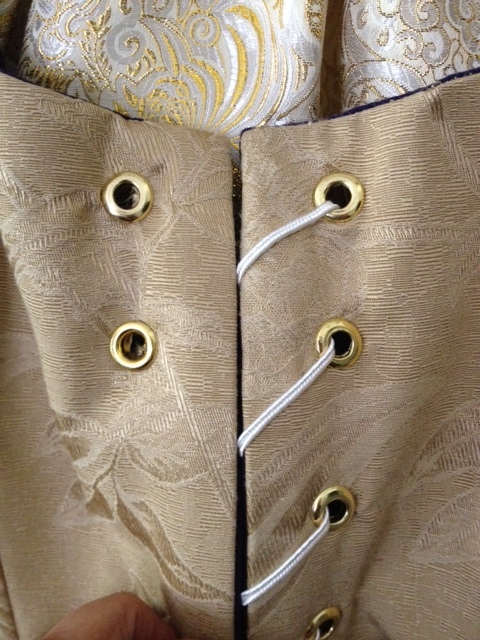 A balayeuse was often made out of gathered fabric, eyelet or lace and sewn on over the hem facing. White seems to be the preferred color, though again if you weren’t wealthy you might have chosen black to get a few wearings out of it before needing to wash or replace it. In order to replace a balayeuse, you or your seamstress simply cut the stitches of the existing one, and to replace it you sewed it back on. As you can imagine, this was rather tedious if it needed to be done practically every time the dress was worn. But of course to the Victorian seamstress, who was necessarily good at hand sewing, this would be no more tiresome than your average load of mending. However, to the average modern seamstress (like me!) who is probably not too speedy at hand sewing, having to rip out and sew back 4+ yards of trim can be kind of annoying. That’s why I’ve come up with a handy hack to make the process of replacing a worn/dirty balayeuse easier. This hack is not an historically accurate technique as far as I am aware, but it creates a reasonably historically accurate silhouette. And what’s better, it involves items that can be readily purchased at a “big box” fabric store. Pre-wash the trim if it’s made of a natural fabric like cotton or linen. Using the beading holes in the lace or eyelet trim as your guide, sew the buttons along the hem facing at regular intervals (I’d suggest no more than 4-5 inches apart). 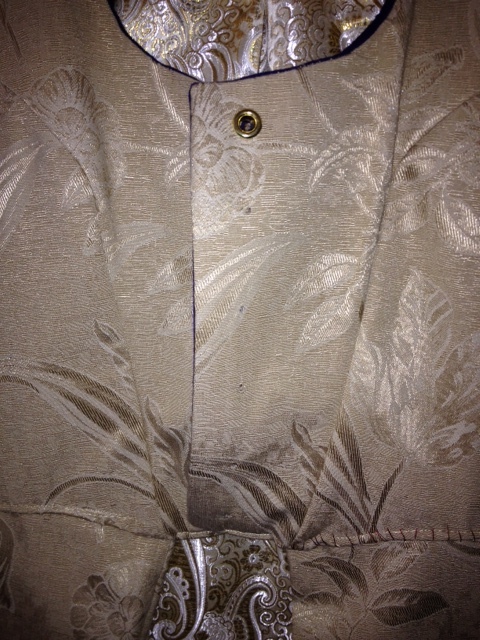 “Button” the trim onto the hem facing using the buttons you just added. Finish the ends of the trim however you like. And that’s it! Now when the trim gets dirty, you can just unbutton it, wash it (hopefully you pre-washed your natural fabric trim it so it doesn’t shrink!) and button it back on. If it gets torn beyond the possibility of mending, you can easily replace it by buttoning on a new length of trim from your stash. No additional sewing necessary beyond adding the hem facing and the buttons when you first created it! Let me know what you think of my balayeuse hack: questions and comments are most welcome. Happy Sewing everyone! About 1 week before attending Costume College 2014, I decided I needed a more historically accurate costume, so I decided to make Simplicity 4078. This was an insane idea. Just putting that out there up front, in case you were tempted to tell me something along those lines. No sweat! Just blood and tears…and more blood…and more tears…but I get ahead of myself. For each bodice piece, I started by basting the lining (black cotton duck), inner interlining (white muslin) and outer interlining (navy denim). Then I sewed boning channels where appropriate, seam ripped across the ends and slipped 1/4 inch featherlite boning into the channels (after rounding the ends with my dull scissors). Finally I sewed across the open ends and basted the facing (poly satin) to the other layers. This is when I discovered that sewing boning channels is one of the most relaxing activities I’ve ever done, other than meditating, sleeping and napping. I’m sure that makes me even more of a weirdo, but whatever. 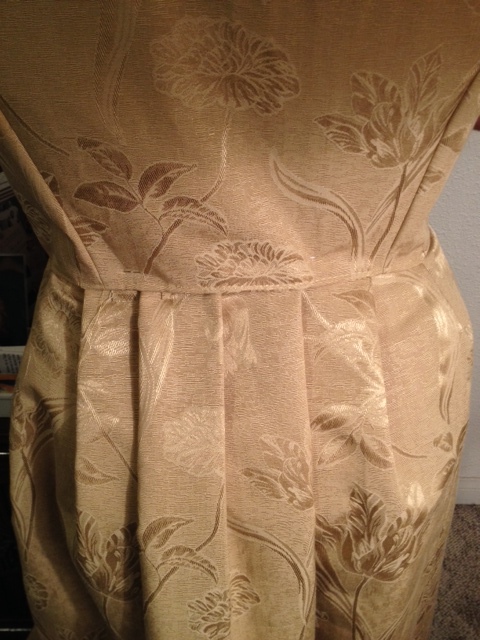 Once all the side seams were sewn I put in hook & eye tape for the back closure. Here I am taking a look at the huge gape in back. Apparently I can’t just sew the tape along the inner edge and expect the outer fabric to lie down flat along its outer edge. Oh well, live & learn right? I ended up sewing very short horizontal stitches between each hook and each eye on either side, and this helped the outer fabric lie flatter. Then I basted the armholes and neckline, not taking too much care because the sleeves would go into the armholes and there wold be lace covering up the neckline. Then I used hem tape to finish the bottom of the bodice, since that would be completely exposed and thus needed to look very nice. 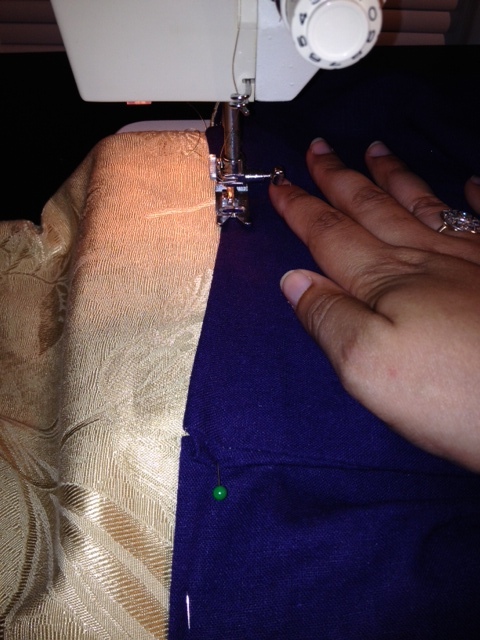 Here I am sewing the folded edge of the hem tape to the right side of the fabric. 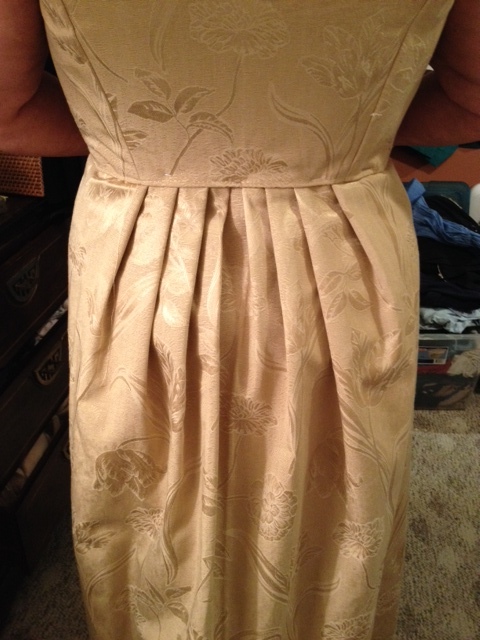 I then folded the hem tape under so it was completely invisible and finished the entire bottom length of the bodice. One sleeve is slightly longer than the other, but that can be easily fixed in post-production…right? Right? 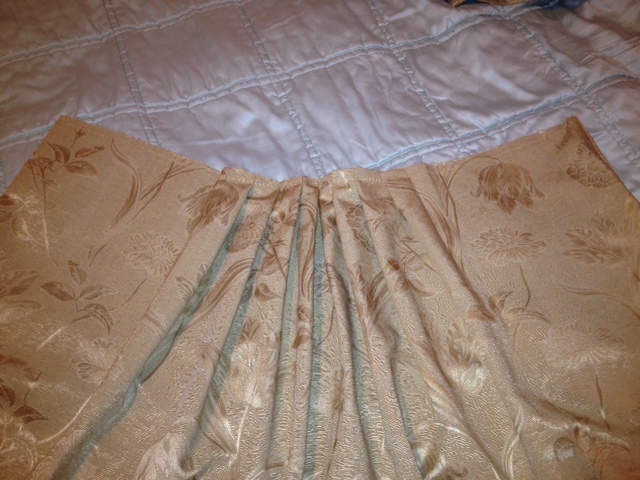 Then there’s the skirt – 7 gores all sewn together, with gathering in the back to fit the waist. In case you are wondering, this is a metric crap-ton of fabric. To make things worse, the right side of my poly satin facing looks almost identical to the wrong side, so I ended up underlining two of the biggest pieces incorrectly and had to seam rip the whole dang thing, flip the facing and re-baste. I did not sound like a Victorian lady that day. After finally correctly underlining each piece with the same white muslin used for the bodice to add a bit of heft (and to be PC) and then sewed them all together with a placket between the back two pieces that I secured with a very un-PC metal snap. Sorry, no pics, I forgot to take them. Maybe someday I’ll edit this post and add one. I think what I really need is a full-length petticoat to fill out the entire skirt from top to bottom. I will probably make Truly Victorian 170 next. I sewed the underskirt using Butterick 5757. For some reason this is the only picture I took of that process, and I don’t even remember what I was doing here. Pulling the elastic through the waist, maybe? Anyways, f you want to know how I did the elastic waistband take a look here at the last time I used this skirt pattern. Finally, I was ready to sew the overskirt to the bodice and be done! This turned out to be a nightmare. I’d long stopped following any sort of instructions at this point, because I used separate bodice and skirt patterns, so there weren’t any instructions on how to sew the two together. What I ended up doing is slipping the unfinished top inch of the overskirt inbetween the bodice lining and bodice outer fabric, then turning under the bodice lining and outer fabric a half inch and sewing the whole shebang together. This sounds tricky, and it was. Unfortunately I have no pictures of it really, except this one below. 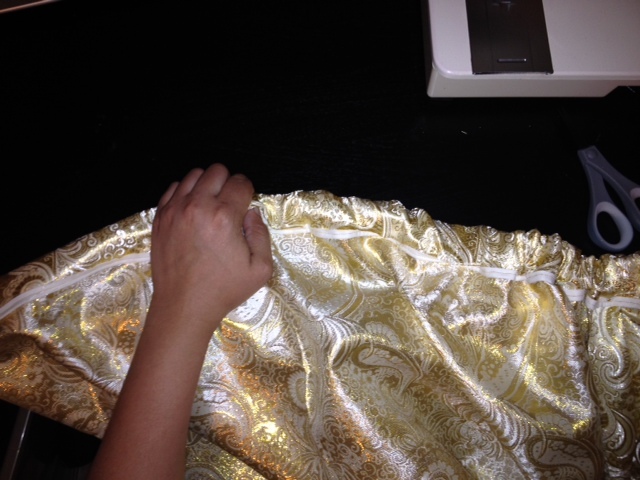 The purple is the bodice lining and the gold is the overskirt. You can sort of see that the gold overskirt is underneath the purple bodice lining,,which is turned under, and underneath all of that is the bodice outer fabric. I should mention that I originally botched this step completely and had to rip out my seams. I then freaked out that it was ruined and took everything to mom, who patiently hand-basted the overskirt and the bodice together while I calmed down, and then I was able to do the final machine stitch. Shout out to my mom for being TOTALLY AMAZING, and for being the body model two pics up! …and then I was done. Here’s the finished dress in a side-by-side comparison with its inspiration, the Pendragon Desree Dress. Took me nearly 20 hours from cutting the pattern pieces to sewing the last stitch, but I had a tremendous amount of fun along the way! In retrospect, I probably should have done a gored skirt to get more fullness near the bottom, but oh well. The important thing is that I now have a simple Renaissance Faire overdress that I can mix and match with chemises and skirts of all colors to create tons of exciting costume combinations! Boning, boning, boning. As far as I’m concerned, it’s not a real bodice unless you’ve got some boning in there, especially if you have a sizable bust like I do. I used two types of boning: 1/4 inch white featherlite in casing and 1/2 inch black featherlite without casing. These weren’t purchased specifically for this project, they just happened to be lying around in one of my storage drawers. I need the most support in front and on the sides, so I used a double layer of the 1/2 inch in those places. The 1/4 inch I used along the front side seams and back side seams. I sized each boning piece by laying it alongside the seam that will contain it, and then I cut it approx 3/4 inches shorter than the seam length. I then trimmed/rounded the ends and put boning caps on. Then I slipped the boning inside the seam allowance and sewed it shut. Normally you’re supposed to sew seam allowances open and flat for a smoother finish, but with thick multilayered bodices these boning pieces won’t really bulge out so it’s OK.
Not bad, though the shoulders seemed to be sloping upwards from inside seam to outside seam, so I adjusted it when I sewed it to account for my shoulders which slope slightly downwards instead of upwards. All that’s left now is to sew the underskirt (gotta decide on elastic or drawstring) and then sew the bodice to the overskirt, and then add the grommets. No sweat! It’s basically a bodice sewn to an open front skirt with an underskirt. How hard could that be? I noticed theirs had no lining and boning only alongside the front grommets. That’s ok, I’m not so bad at doing lined bodices and adding boning to seam allowances. I started with Butterick 5757 for the skirt, which I’ve worked with 3 times thus far with great results, allowing for an extra 6 inches of width along the fold so that the piece would wrap around partways in front like the Desiree picture. I cut two pieces so that one could be used as lining. Next I used McCall’s 4107 for the bodice, opting for the simplest option with front laces, and eliminating the back laces. I cut outer fabric to match the skirt above, as well as interfacing and lining (dark color to hide sweat stains better). Next up: tackling the boning! I was going through the mounds of fabric in my work room today, and I discovered something I’d set aside almost an entire year ago: a pile of completely cut pattern & fabric pieces for Simplicity 3637. Why I didn’t see this earlier in the year I have no idea. I even remember buying the green & gold damask fabric, a purchase I was particularly proud of given that I managed to nab all 22 yards for under $100. This is not an intimidating pile of fabric at all. On the other hand, the part of sewing I hate most is pinning and cutting out the pieces, so I can either start from scratch with a simpler pattern and be miserable until the cutting is done, or I can get started with sewing on this insanely difficult pattern. 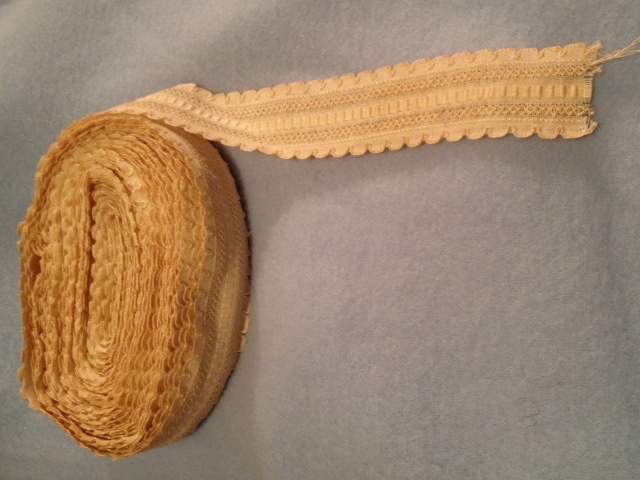 Recently a friend of mine was cleaning out her deceased aunt’s house and came across the remainder of a bolt of old fabric and a length of aged white lace, both of which she offered to me since she does not sew regularly and I was the closest crazy sewing addict she knew. 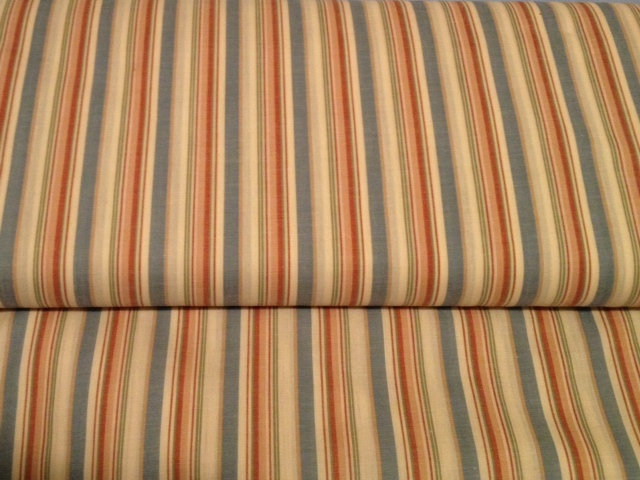 The fabric is a thin red, white and blue striped 50/50 cotton/poly blend, 44″ wide, and the lace is about 1.5 in wide and nice enough to be decorative for a day gown. Normally this wouldn’t be categorized as a windfall, but I measured the fabric and it’s roughly 17 yards long. I haven’t measured the lace, but I’ve guesstimated that there are at least 10 yards of that too. Guess who won’t be buying muslin for a while?